It would be easy to get excited about this chunky yellowfin tuna that our amigo, Jeff Sakuda, caught, but it was a solo fish in a year when the tuna never really showed up. 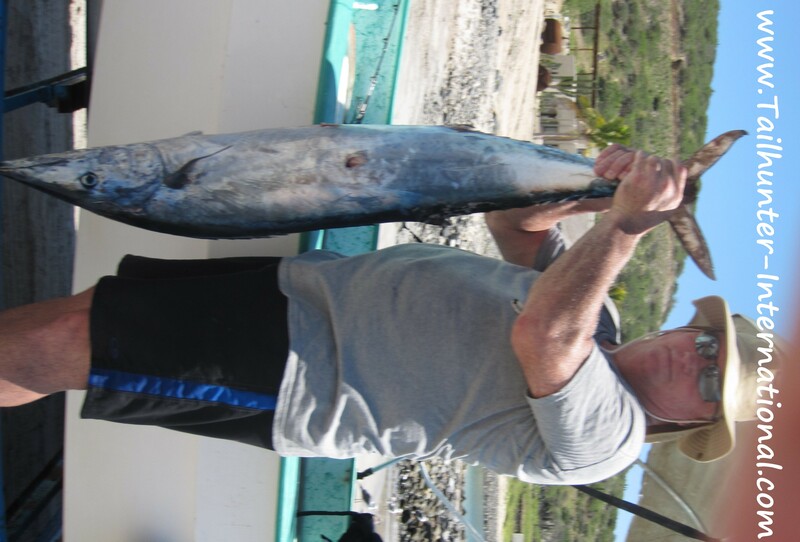 In fact, Jeff was trolling for wahoo when this fish hit south of Cerralvo Island. Popular Captain Pancho bundled up against the winds, helps Aaron Foxworthy of San Francisco show off a really good looking bull dorado. That’s El Sargento and La Ventana in the background. 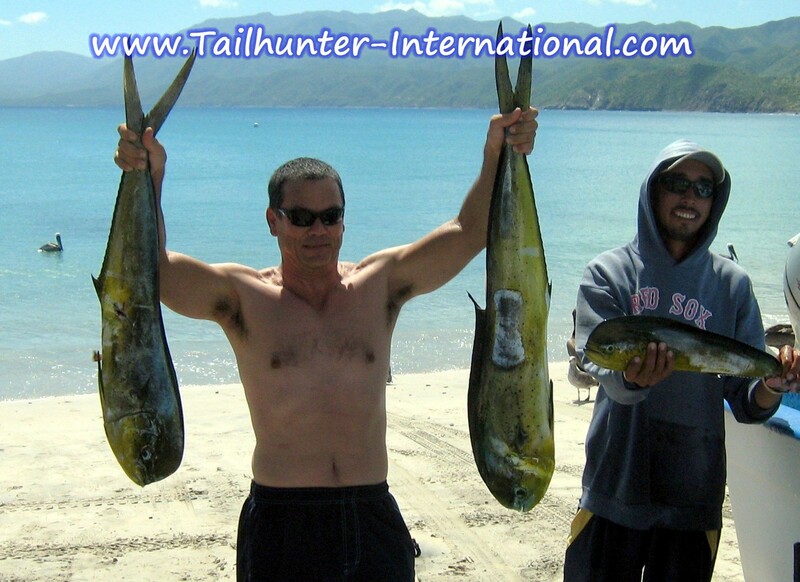 Aaron was fishing with our Tailhunter Las Arenas fleet. Someone in the back poster bombs Capt. Victor who poses with Ken Mitchell from Medford OR and Ken Gragg from Bakersfield CA showing off some of their dorado taken just outside of Bahia de Los Muertos early in the week. 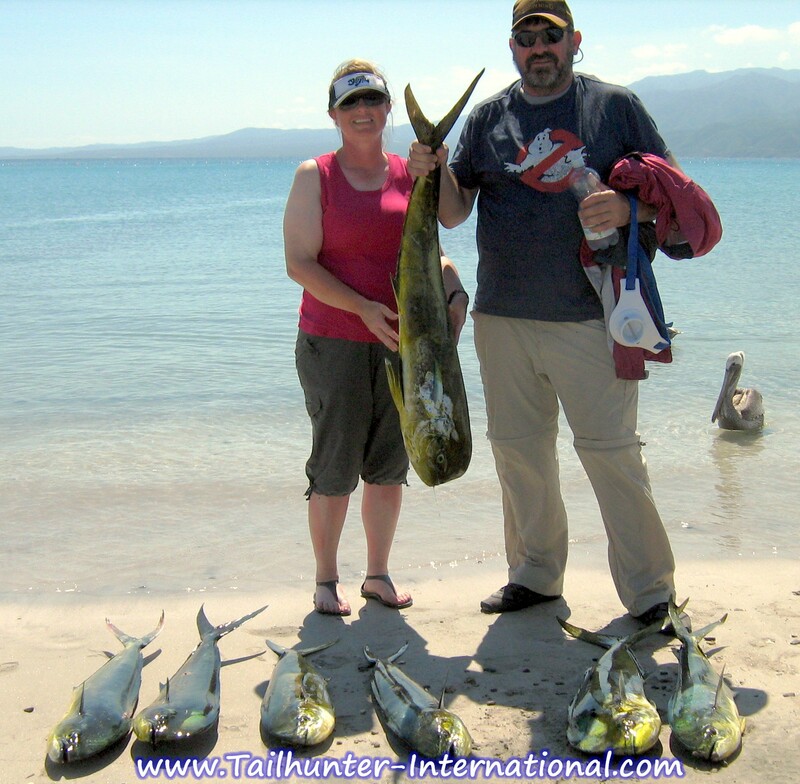 First-timers to fishing La Paz, Mike and Donna Madrid fished 3 days with Capt. 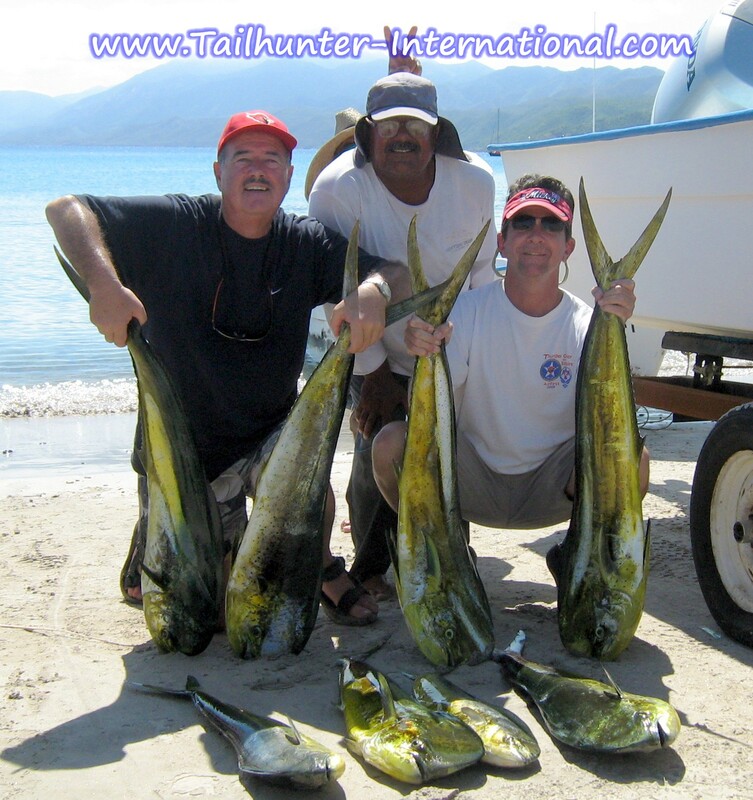 Pancho and did some rod-bending on dorado like these fishing with our Tailhunter Las Arenas fleet. 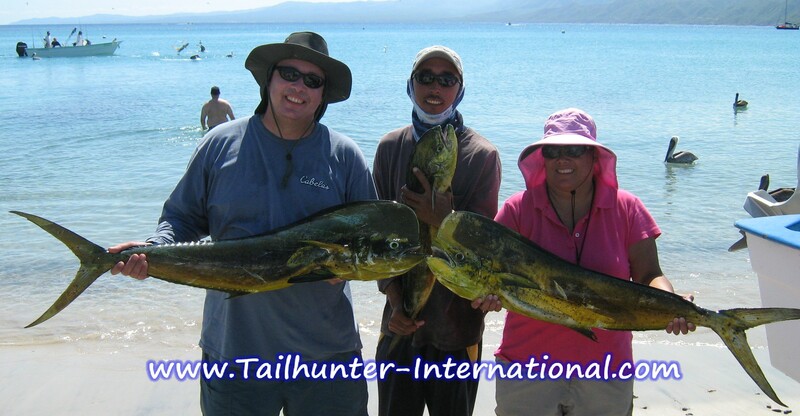 Light tackle pro bass fisherman from Washington, Mike Whitlow, hung tough during some rough days fishing and still ended up with some nice dorado like these especially fishing with our Tailhunter La Paz fleet. 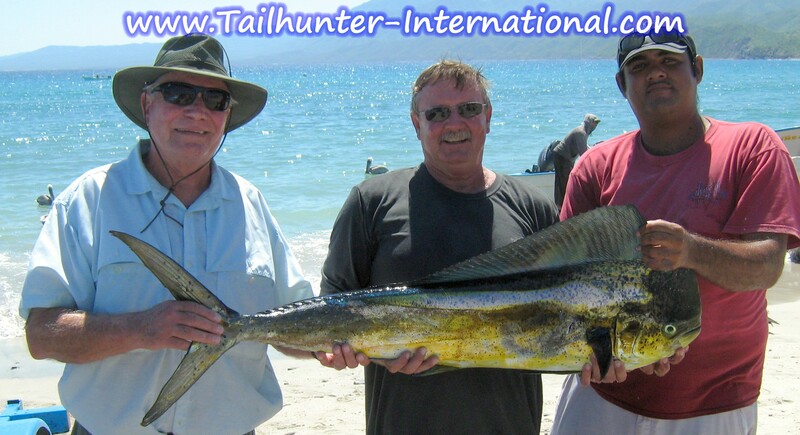 Don Buss hoists a couple of dorado next to Captain Pancho on the beach at Bahia de Los Muertos. From Mt. 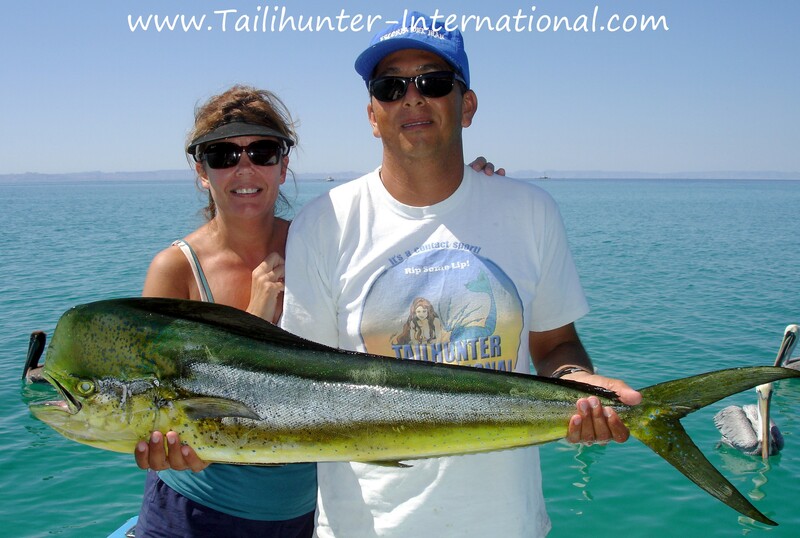 Vernon, WA, on their first visit to us in La Paz, Dave and Melissa Burton did some nice fishing for dorado on their first day with our Las Arenas fleet. 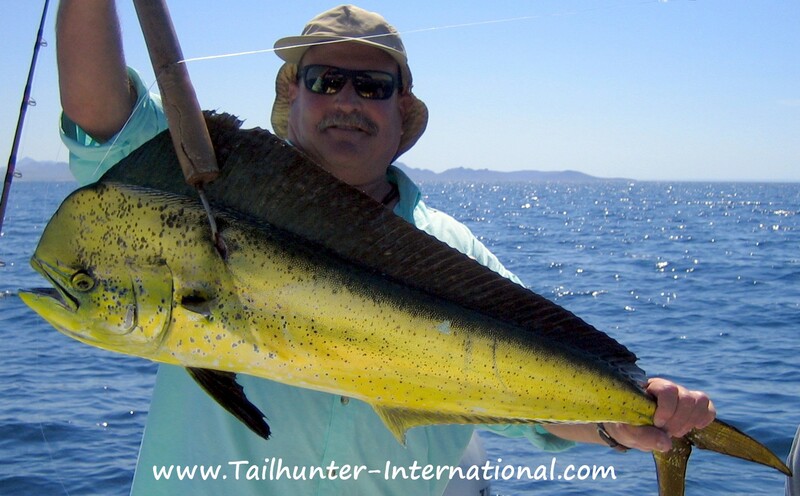 Great shot of a nice dorado on light tackle landed by Ed Vander Veer (Sorry Mike and Ed) fishing with our Tailhunter La Paz fleet. 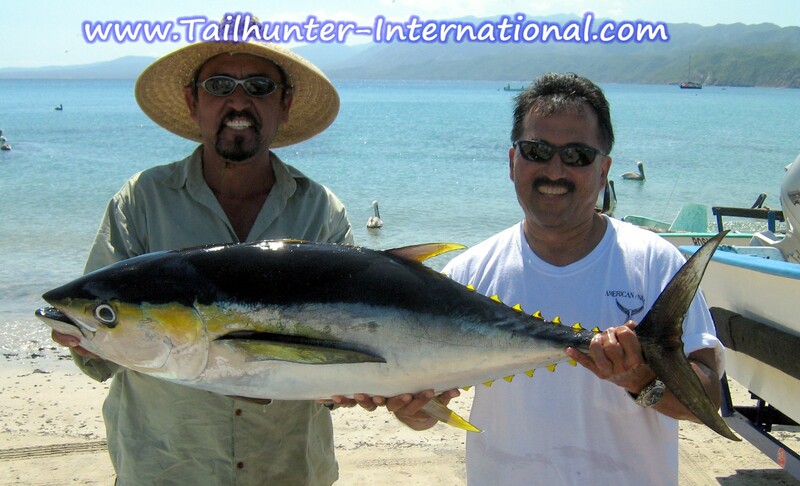 Note the “tiger markings” on the bull dorado. SEASONS CHANGING AND GETTING COOLER SLOWS FISHING! 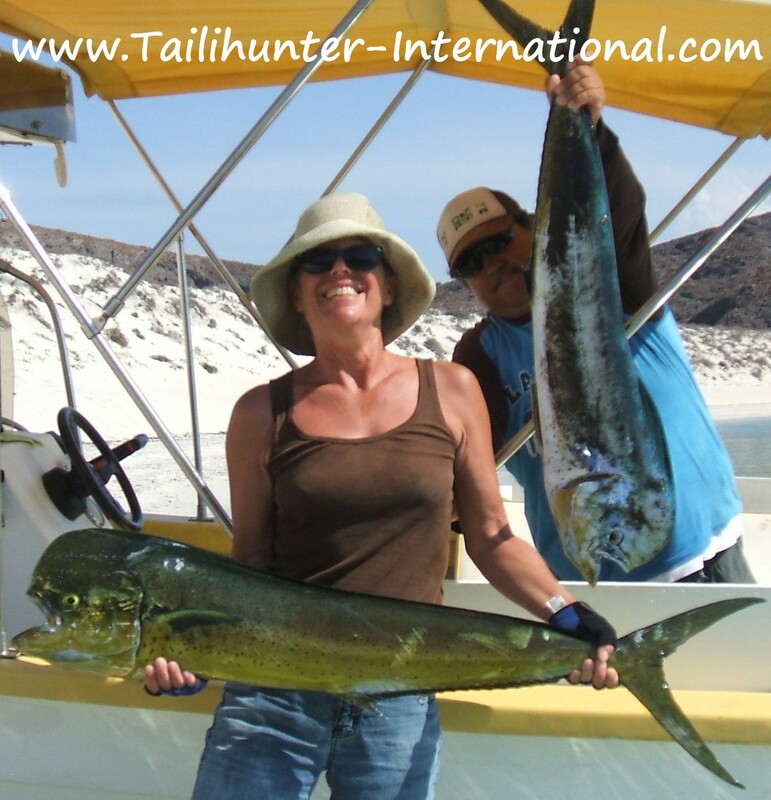 The week started off strongly with some of the best dorado fishing in weeks for both our La Paz and Las Arenas fleets. 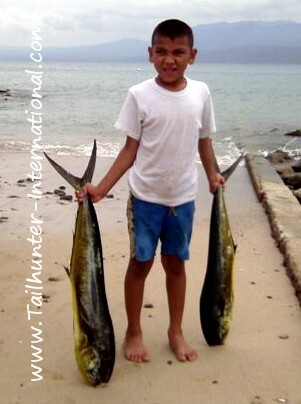 In fact, we had quantity as well as quality good fishing. Good numbers of fish mixed with great size and fish between 15 and 35 pounds made for some great action and happy anglers. However, as the week went on, it seems to be clear that our seasons are changing. Within just a few days, it seemed like summer just disappeared. Normally, we don’t see these changes until a few weeks later in November but this seems characteristic of the strange season we have experienced this year. At least, sometimes the change is more gradual. This past week, it was like someone threw a switch. Late in the week the dorado bite diminished by half. The water temps dropped by 5 degrees. The winds increased to kick up whitecaps and changed to being northern winds. We started seeing more pargo, cabrilla and sierra in the counts which are normally all cold water fish. It seems like the shadows are longer and it’s definitely cooler. Suddenly, there’s no humidity in the air. If you’re on shore, the conditions are incredible for hanging out at the pool or on the beach. If you’re from somewhere that’s cold where it’s already raining or snowing these conditions seem like paradise under the swaying palm trees. If you’re here to catch fish, it’s maddening. Conditions vary from day to day The bait changes from day to day. The bite is as variable and enemic as the weather. One day good. Two days slow. One day calm. Three days windy. 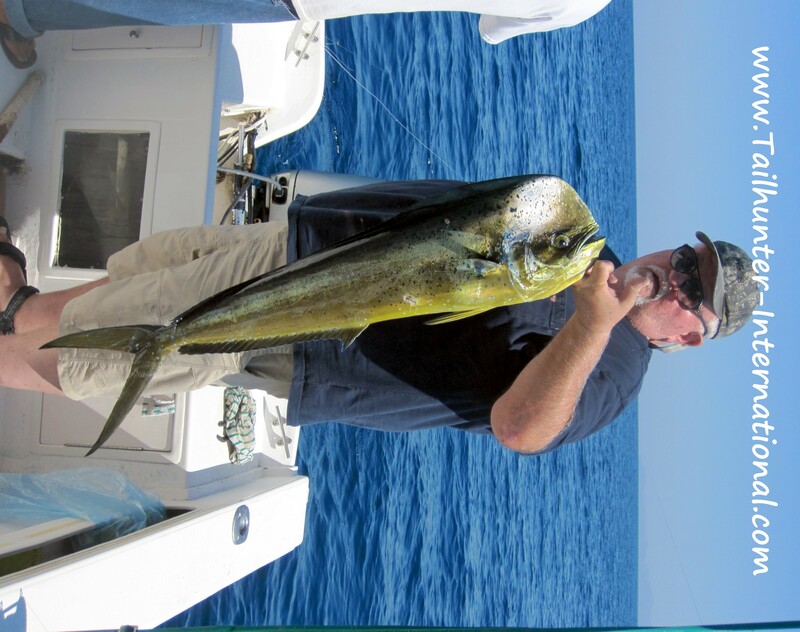 I don’t know how much longer the dorado will be around as they are warm-water fish. But they’re still biting. 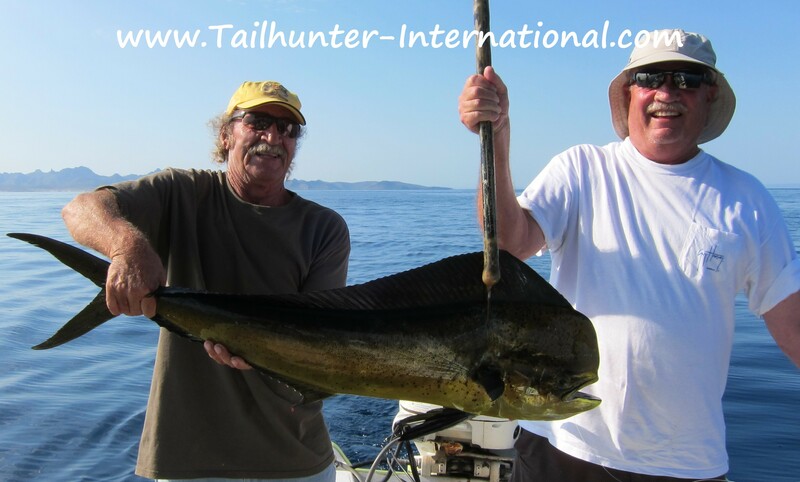 We also had a decent week of sailfish and striped marlin as well as some roosterfish and some inshore rock fish. Plenty of bonito. Mike Whitlow and dad, Bobby, (Kennewick WA) stand amidst a “pretty good day of fishing.” They didn’t catch ALL these fish, but did pretty well. Actually, the fish are the lineup of 6 of our La Paz pangas that afternoon. 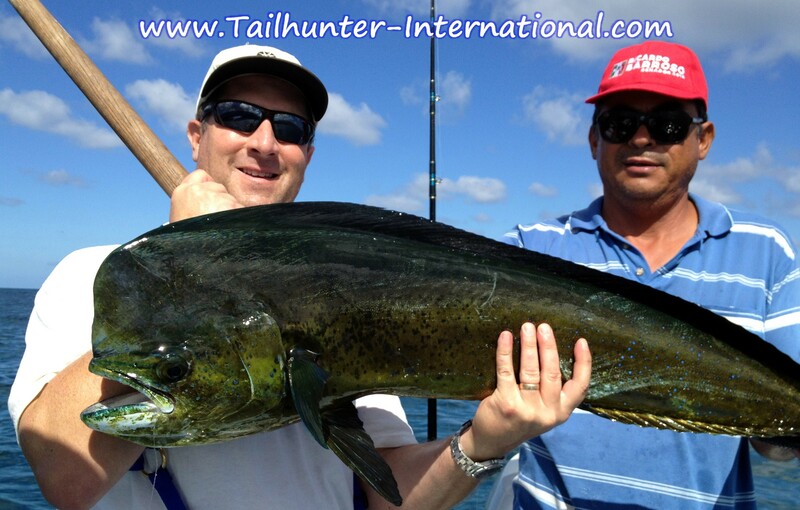 The fishing started out slow because of Hurricane Paul, but as the week went on the dorado came charging back! 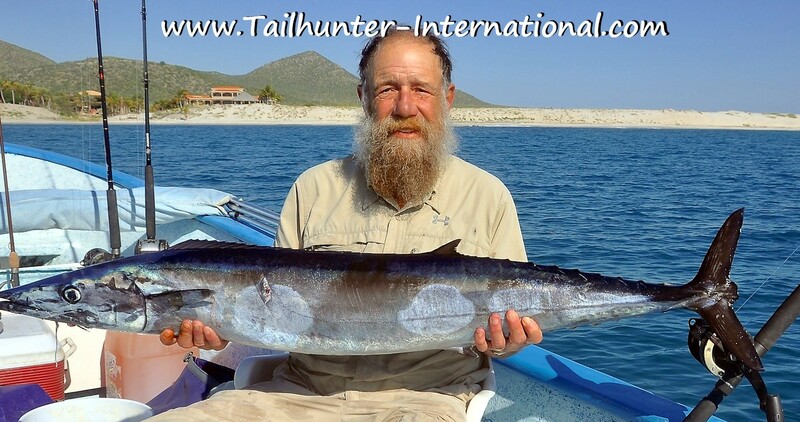 Great colors on this fresh bull taken north of La Paz by Ed Vander Veer on light tackle. This nice quality fish that Ed’s holding was pretty typical of the better sizes this past week plus many larger! First timer from San Francisco, Steve Pinedo, got caught the first day and stalled by the hurricane and almost didn’t make it! But he got back in a good way with some outstanding dorado fishing including this hefty bull with Captain Marcos his first day of fishing. From Clackamas, Oregon…fishing partners Todd Carver and Don Hines stacked some good fish later in the week after a slow start, but made up for it with some nice quality fish like these dorado while posed at Balandra Beach. 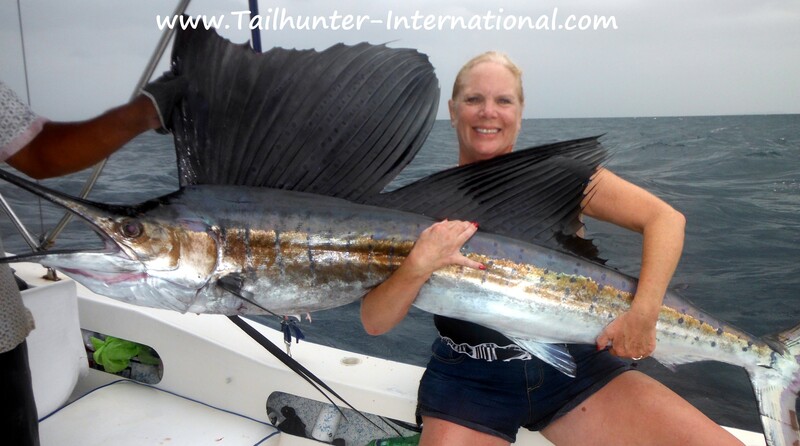 Trophy sailfish for Mary Heilman Vander Veer, our amiga from Washington. Mary will fish anytime…any place even in the rough weather we had before and just after the hurricane. 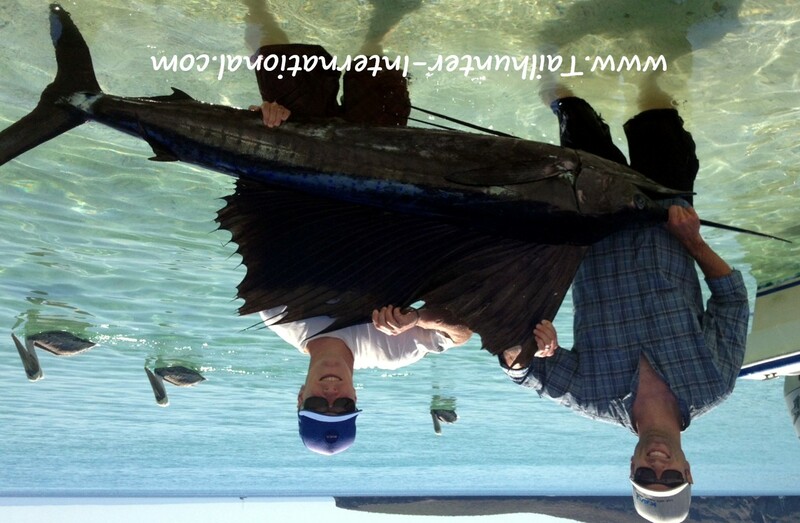 She got her first sailfish here with our La Paz fleet after battling it on light tackle. Attempts to release the fish were unsuccessful and the fish was donated. Nicely done. We had amigos from all over this week! From Arizona, Darrell LaMoure gets a hand from John Osborne on their first trip with us in La Paz. 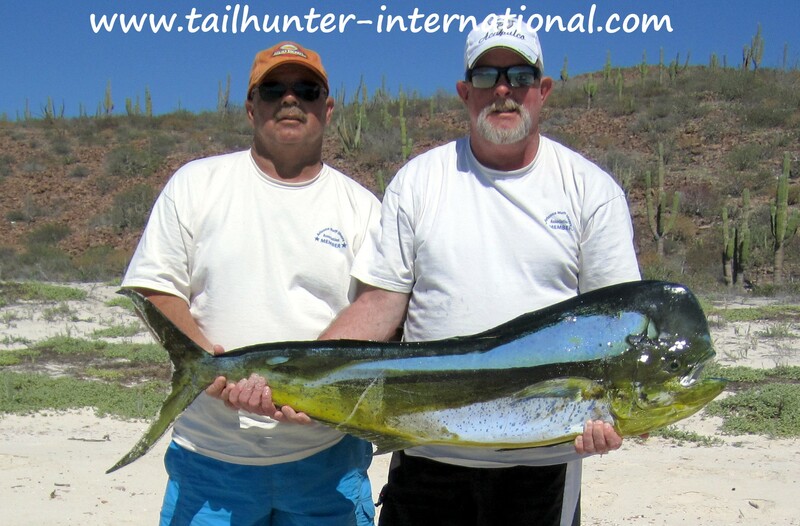 That has to be the shortest fattest bull dorado I’ve seen all season! It’s a trophy fish! Al Yetter has already made two trips to see us this year and is working on dates for 2013. From Colorado, Al never seemed to stop laughing. 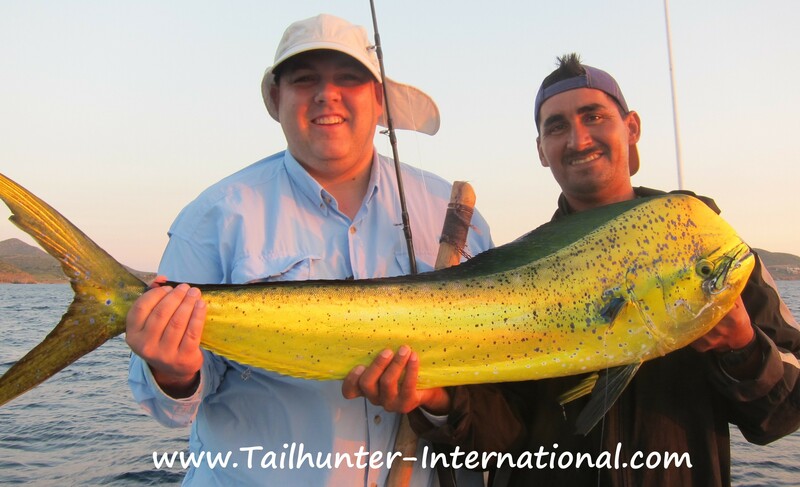 Great colors on this hot bull dorado taken out of Las Arenas. Captain Pancho looks on! Birthday fish for first timer, Craig Brown and Bob Layco, who came to see us from Washington. They also had to wait a day or two for the storms to pass, but got into the fish their last day and pulled on some good dorado like these two north of La Paz! Charger fan in the house! 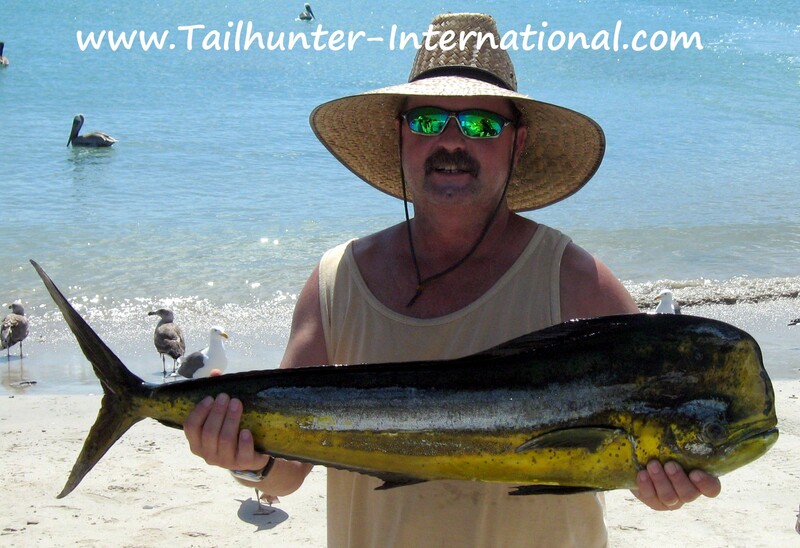 Mike Shaw holds up one of his big dorado he caught while visiting us from San Diego on his first outting with Tailhunter. 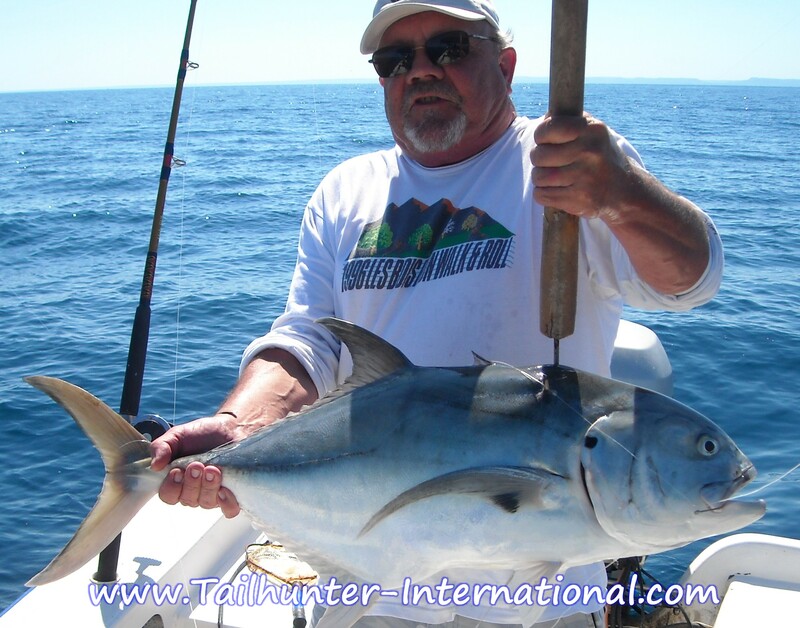 This fish was taken on live bait with our Tailhunter La Paz fleet. Kenny Cambell hold up one of his Las Arenas dorado. 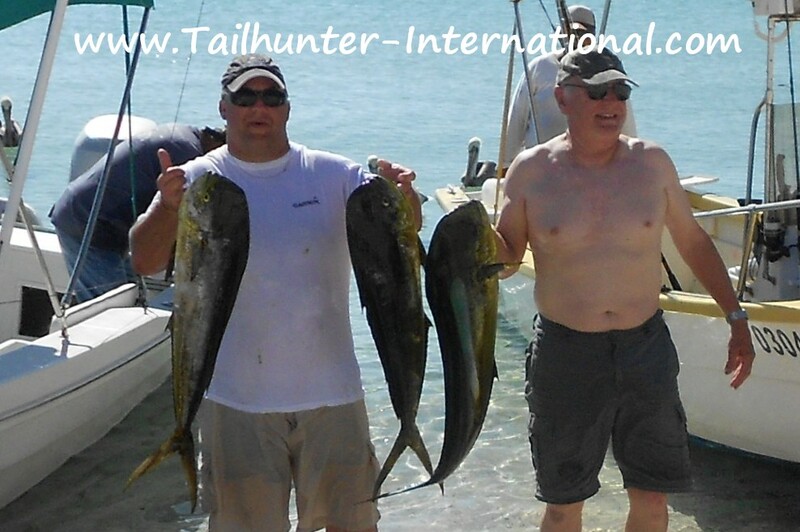 Both our Tailhunter fleets had good showing this week after the storm passed. Las ARenas seemed to have more fish and La Paz had the larger fish! This beautiful pargo mulatto (barred pargo) caught by Don Hines from Oregon ended up serving 13 people at our Tailhunter Restaurant that night! He was fishing with Captain Rogelio striking a pose in the background. Lots of great amigos from Washington and Oregon these past few weeks including Erick Johnson fishing with Captain Alfredo putting this hefty bull dorado in the box near Espirito Santo Island. Great time for light tackle! 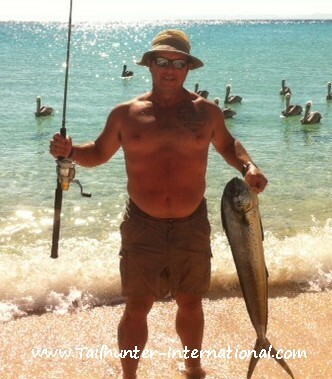 Bill Leech, all the way from Florida kept his spinning gear handy and took a nice dorado in the shallows! 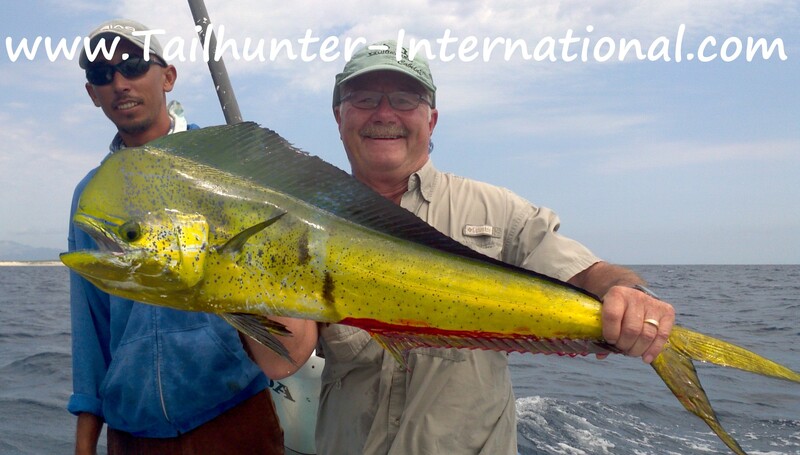 HURRICANE PAUL BRUSHES BY BUT FISHING RECOVERS FAST WITH DORADO CHARGING BACK! What a crazy week! It started off well, but then a surprise hit as we were winged by the edge of Tropical Storm Paul that turned into “HURRICANE PAUL!” Fortunately, we dodged the big bullet unlike our fellow cities to the north like Loreto ,but in La Paz we were still hit with winds and 2 days of rain that were enough to cancel our pangas and keep our clients hotel-bound for a day-or-two! Believe me, that’s as tough on us as it is on our clients to have to stay indoors during their vacation! But we started out again by Wednesday and with each passing day, conditions improved. In fact, they got better fast! I was amazed at how fast the muddy cloudy waters cleaned up. Faster than normal, which I’m sure had something to do with the improved bite. Also the hurricane like winds did take a few days to diminish and we did have a few queasy souls out there the first few days after the storm (but some admitted it was abetted by too much tequila consumption the night before!). But, again ,with each passing day the weather, water and winds improved. In fact, since the storm, we’ve had some of the prettiest days in a long time. Just brilliant blue. The surrounding hills and mountains also could not be greener or more vibrant with flowers, grass and trees going full turbo…and the wild cows eating like it’s a free buffet line! But, we’ve had more rain in the last month than we’ve had in 5 years combined! As for the fishing, as I mentioned, we started the week well. It’s been a pattern all year. We get going well then a storm comes along and changes the fishing landscape. 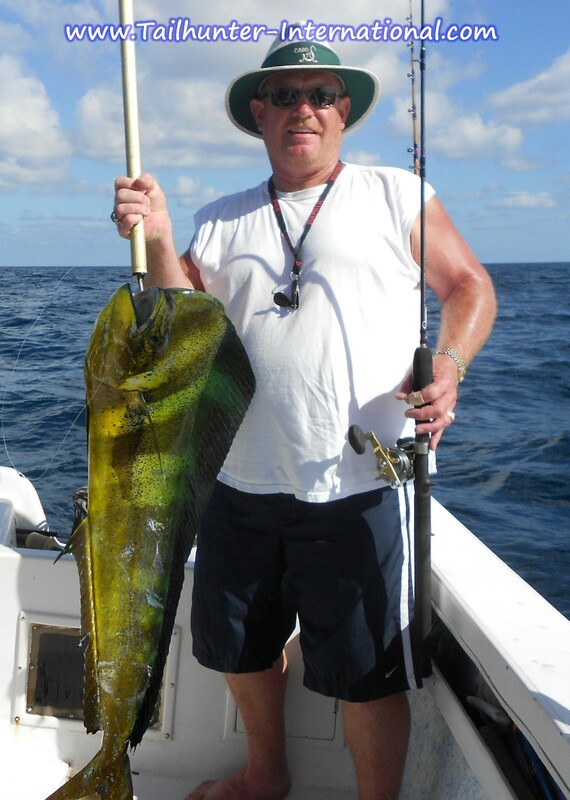 However, the dorado fishing by the end of the week was going solidly . 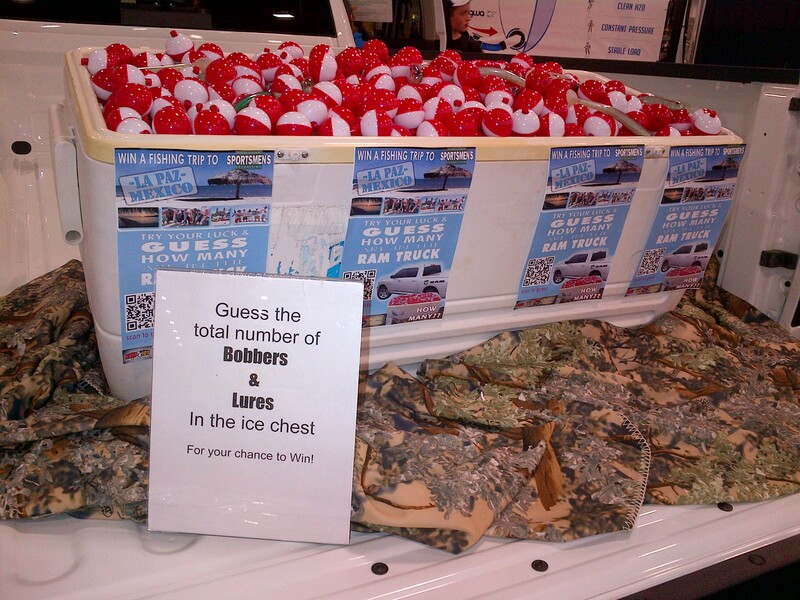 This is for our La Paz as well as our Las Arenas fleet! Not only did we have good number with limits being common, but also, the quality of the fish has been much improved. We’ve probably gotten a better ratio of bulls and fish in the 20-40 pound class than we’ve had all year. The fish have moved around quite a bit, but with a little patience, we’re finding the fish. You just have to be patient. Some of the clients have admitted that they were getting discouraged when they had not had a bite by 11 or 12 noon, but then all of a sudden the rods went off and it was crazy nuts until the fish box was full! The late bite has been a common pattern. So, just hang in there! 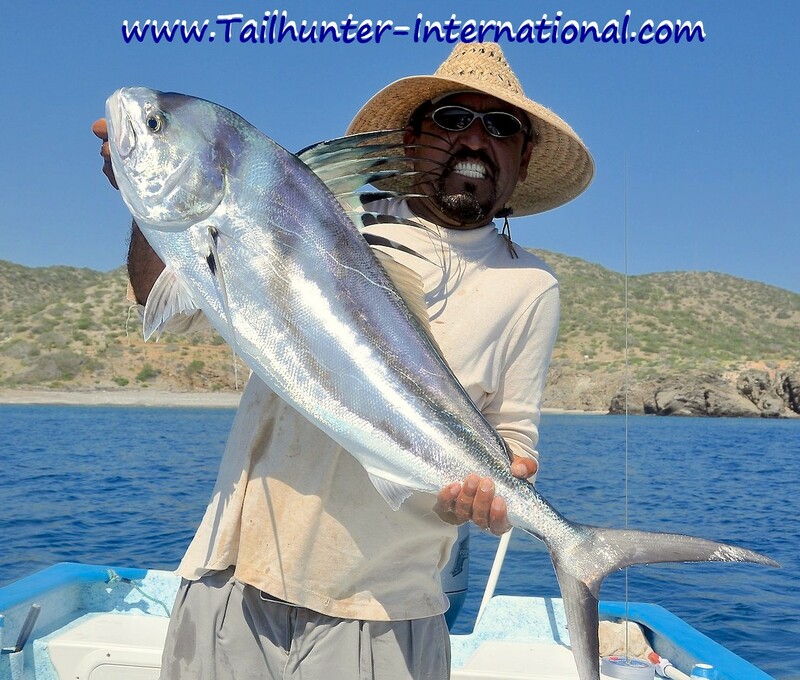 In addition to the dorado, every day we’re getting marlin and sailfish hook ups with most fish being released plus nice roosterfish are still working as well up to about 40 pounds. 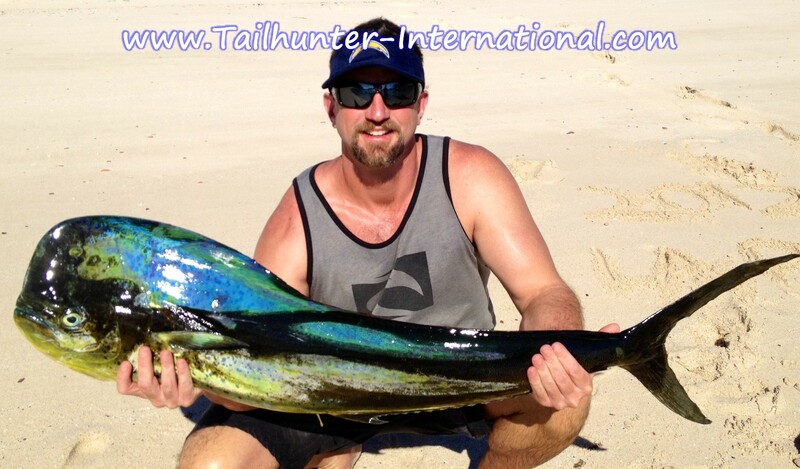 A few giant trophy pargo and cabrilla also being caught! Unfortunately, no tuna but giant squid seem to keep popping up every few days. 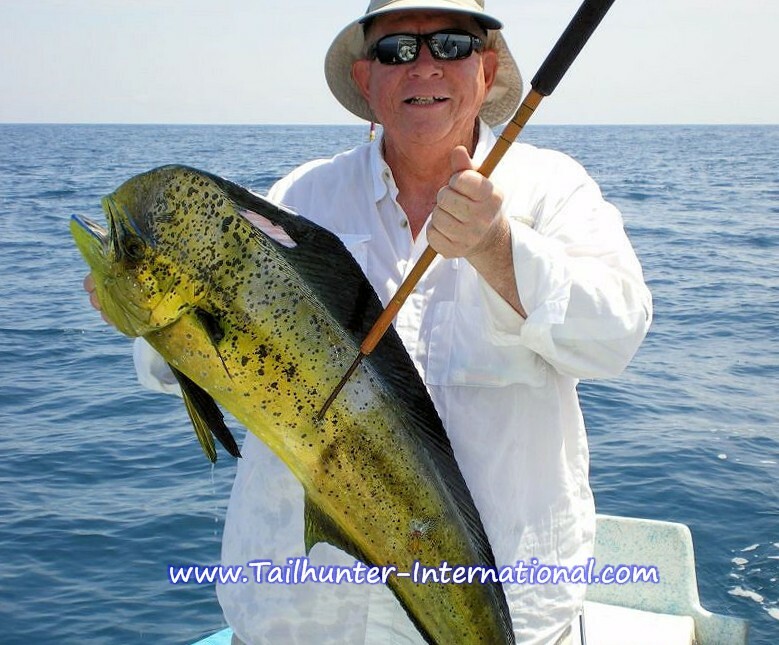 It was a good week for dorado fishing and this nice bull with the great colors was put in the boat by Nash Johnson from Washington with Captain Adolfo. 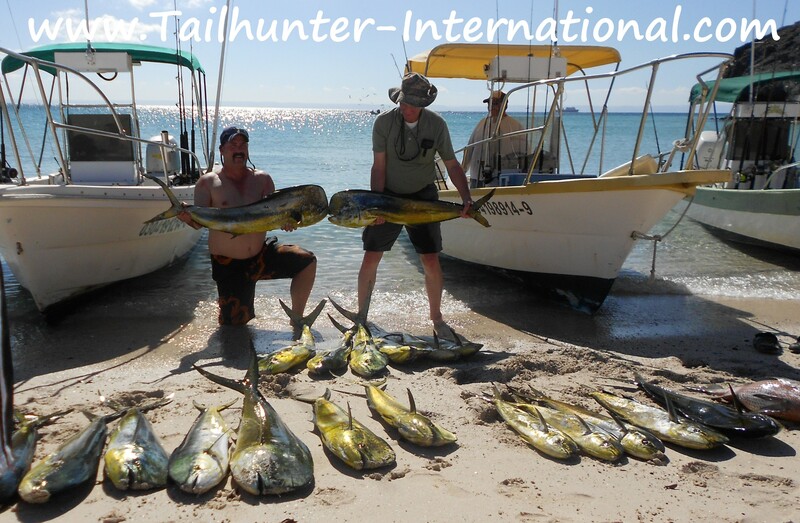 Dorado were hot for both of our Tailhunter fleets this week. Our La Paz fleet and our Las Arenas fleet were into dorado all week, with excellent weather most of the time. Our amiga, Donna Drucker, who visits us every year was with husband, John, and Captain Joel when she took this nice bull north of the city. He’s usually running road construction operations in Boise, ID, but Steve Walker got down to see us on his first La Paz trip and had a tussle with this feisty jack crevalle (“toro”). 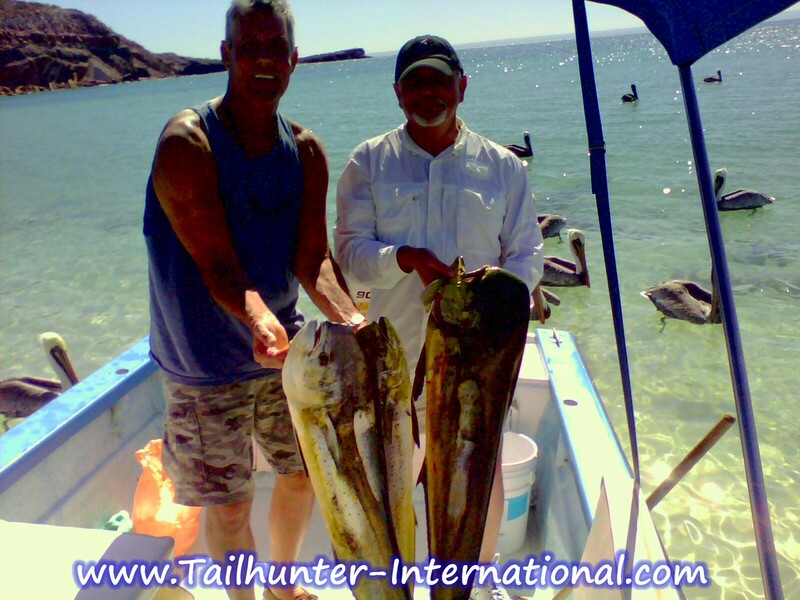 Long time Tailhunter amigos, Byron Shovlain and George Bonner, spent 3 days fishing with our Tailhunter Las Arenas fleet and Capt. Archangel and filled the box with some nice dorado like these! Alaska amigo, Rod Brown, extended 3 extra days and it paid off in extra days of fishing and this fat wahoo he got on a purple Yo-Zuri. Two of the nicest folks…Stephanie and Kelly Mizuno…always spend time with us each year from Sacramento CA. 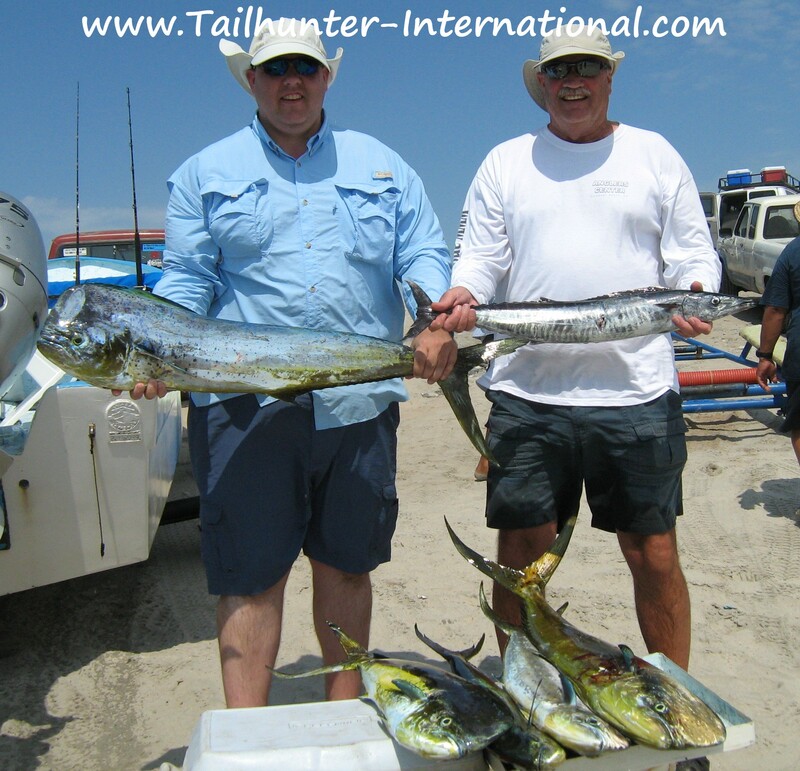 They also got into some great dorado fishing with both of our fleets. “She outfished me 5 – to -1, ” said Kelly! From S. Dakota, Deneen and Mark Clausen, were on their first trip and grand-slammed some great variety one day with dorado, roosterfish, cabrilla, pargo, giant squid and bonito. Captain Jorge helps with the photo. 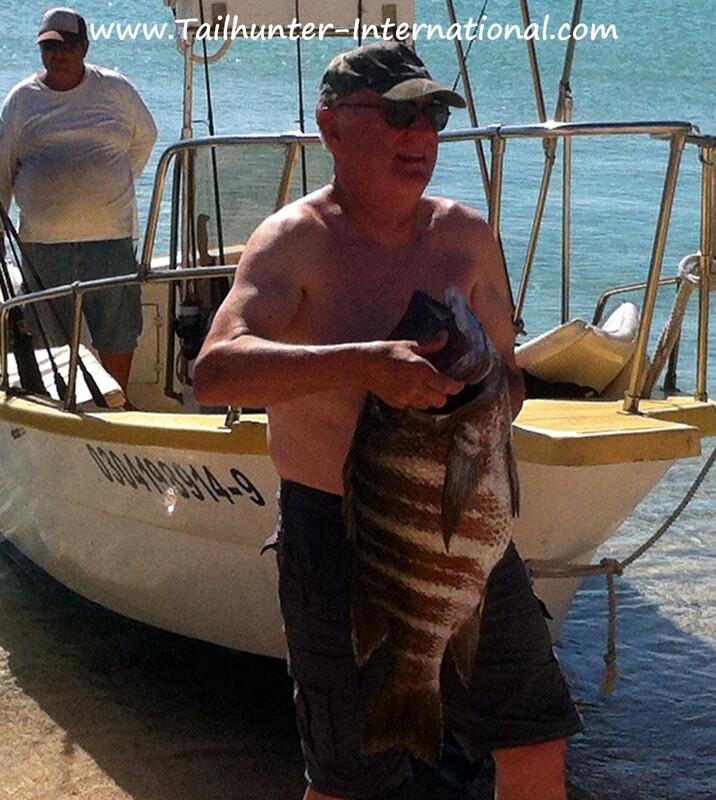 Captain Jorge again…poses with a nice roosterfish off Bahia de Los Muertos. The fish was released. This is typical of the rooster sizes we were hitting this week. 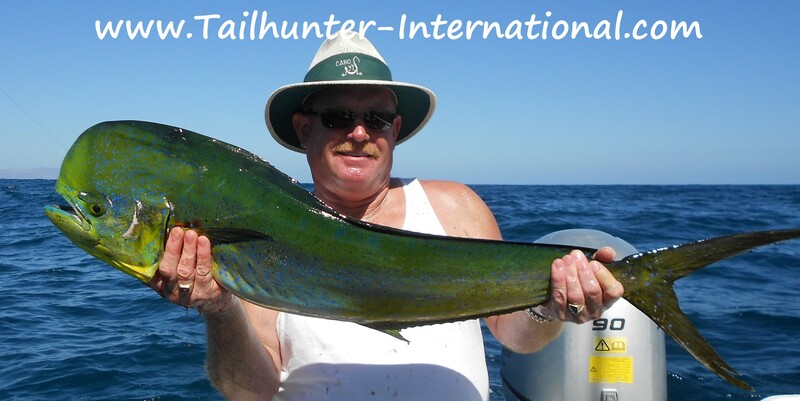 Steve Snead from Boise, ID, started slow but finished in full turbo mode with the dorado fishing after spending the whole week with us. 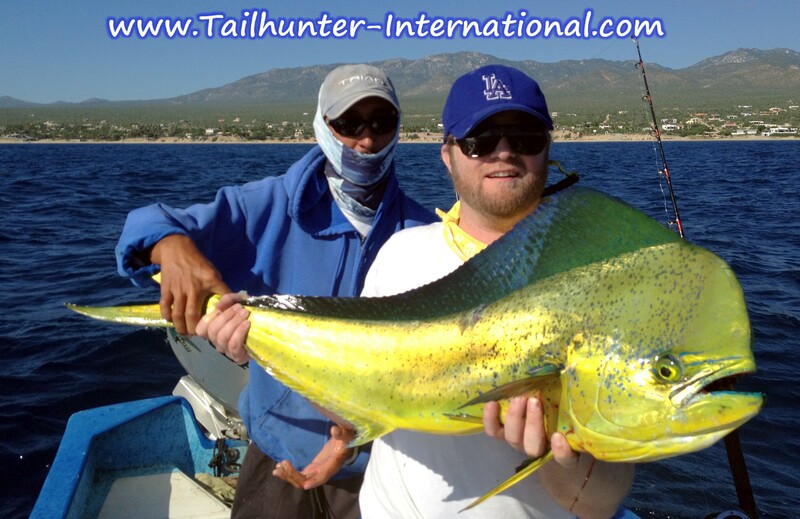 Great shot of a bull dorado taken north of La Paz. Seems like we get more and more great folks from the state of Idaho! Paul Wakagawa and Mark Echeverria (sorry ’bout that, Mark!) 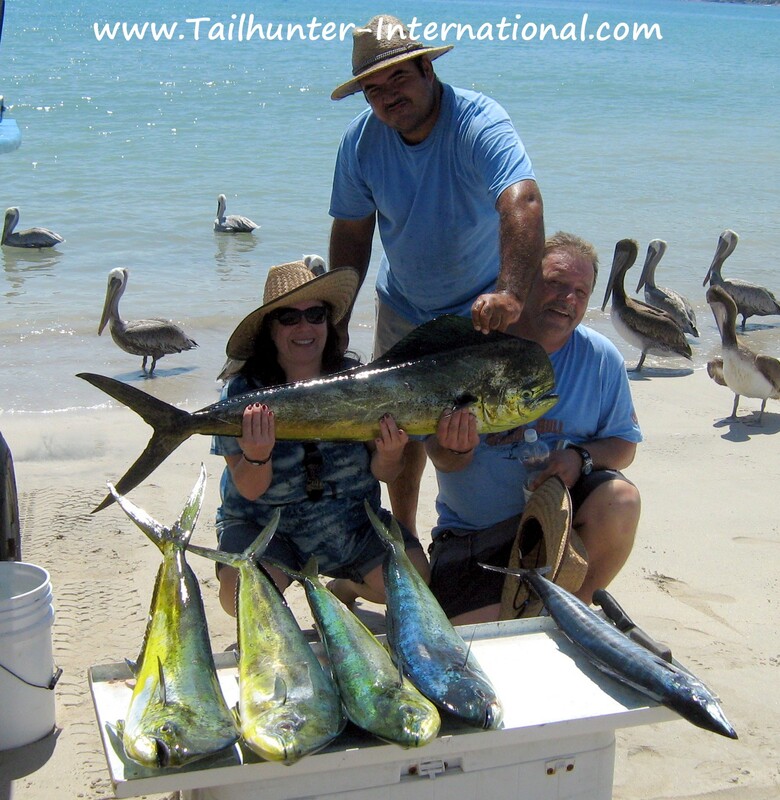 were a hoot on their first visit and show off a pair of their dorado on the beach at Bahia de los Muertos. Utah in the house! 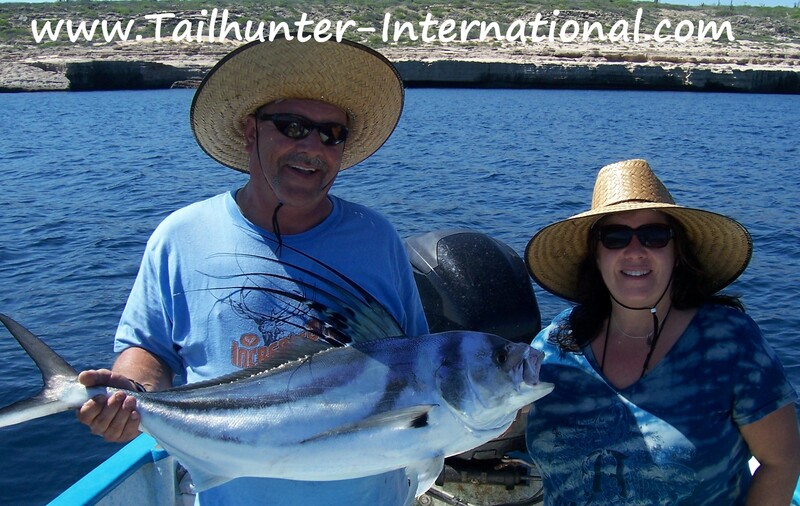 From Salt Lake City, Lee and Jeanette Gillman pose with one of their roosterfish caught off Punta Perico. They released the fish. 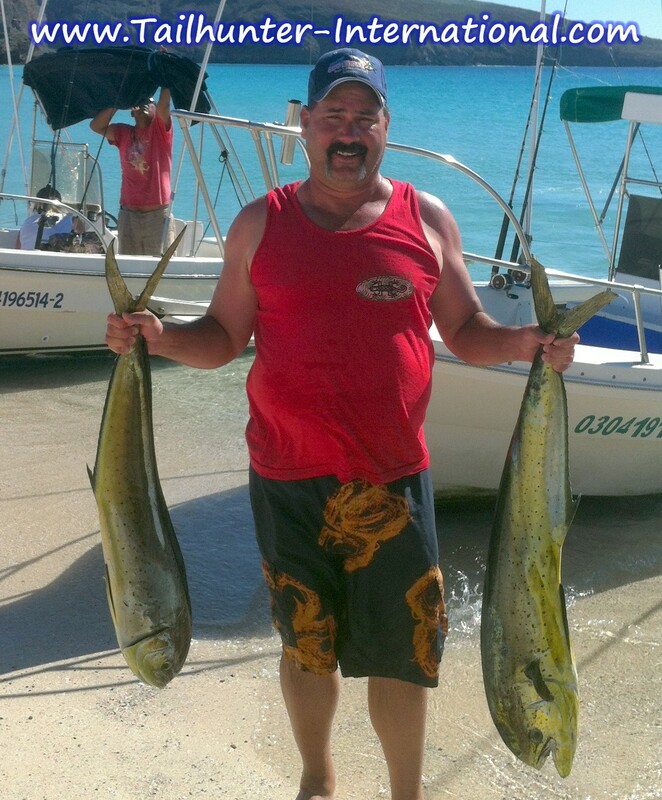 Captain Rogelio tries to photo bomb Bobby Sherling holding her dorado she caught with our La Paz fleet north of town and shown here on the beach at Balandra. DORADO CRASH THE BITE AS FISH PILE UP IN THE BOXES! With almost perfect weather and a perfect moon, the week still started so-so, but gradually got better and better as the week went along with both our Las Arenas and our La Paz fleets pretty much firing on all cylinders and the dorado bending rods on both sides. Not much to say! The photos tell it all. It was a pretty solid good week for fishing! Our Tailhunter Las Arenas fleet really hit it’s stride with some of the most consistent fishing we’ve had all season there after the first few months of the season were really slow. Sure, there were the occasional times when this panga or that panga had some off-fishing but for the most part, it was all-around great fishing for a variety of species all well that just got better as the week went on. 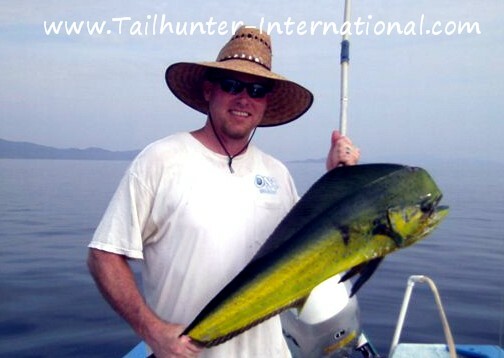 Sorry, no tuna, but the dorado sure came to play with consistent 10-25 pound fish and on a few days, there were easy and early limits with dorado pandemonium hitting the fleet with double and triple hook ups ripping the anglers. But, on top of the dorado, by the end of the week we were also getting bent by giant squid, jack crevalle, roosterfish, some wahoo, a few marlin and sailfish, pargo, cabrilla, sierra and lots of bonito. This made for a lot of tired arms and backs by the end of the day and mostly some big grins and smiles! For our La Paz fleet, not as many dorado as Las Arenas, but what it lacked in quantity made up for in quality. 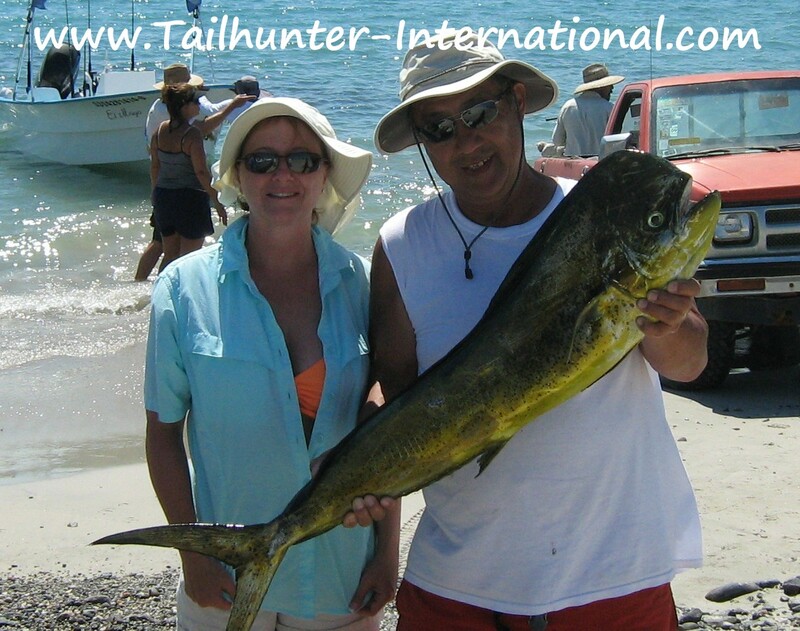 The La Paz dorado were generally larger with some fish in the 30 pound class hitting the fish boxes. Hopefully, it’ll just be a nuisance. What a crazy year it has been.